Senolytic Activator: Our NEW Senolytic Activator combines black tea theaflavins with an ultra absorb able form of quercetin to help manage senescent cell burden and promote systemic rejuvenation. Fight back against cellular senescence with Senolytic Activator! Cellular senescence is a natural part of the ageing process in which cells no longer function optimally. Senescent cells can accumulate over time, affecting the day-to-day function of the healthy cells around them. Senolytic compounds selectively target senescent cells. New research indicates that black tea theaflavins and quercetin target specific biological pathways, making it easier for the body to manage senescent cells. Theaflavins are compounds derived from Camellia sinensis (tea plant). These compounds have widespread health benefits – supporting healthy cell division and healthy inflammatory response. New research indicates that theaflavins may be especially helpful for reducing senescent cell burden. In pre-clinical models, theaflavins helped powerfully inhibit the accumulation of particular cell senescence bio-markers. Quercetin supports endothelial and cardiovascular health, promotes healthy immune function, and more. The value of quercetin has been recognised for some time. But its potential to meaningfully impact whole body rejuvenation is just starting to be uncovered through its senolytic activity. The discovery that quercetin is a senolytic compound has drawn significant attention to this unique approach to combat ageing. Standard quercetin is hard to absorb. But this formulation features our new quercetin phytosome, a phospholipid sphere that encases the quercetin, aiding in its absorption and making it up to 50 times more bio-available. 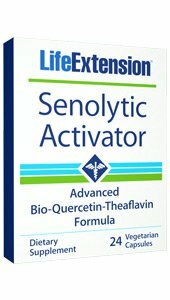 Manage senescent cells, promote healthy cellular function, and support overall longevity with Senolytic Activator! And for those who aren’t keen on adding another supplement to their regimen, here’s good news: senolytic research indicates that intermittent dosing in pre-clinical studies is effective at improving health span. So Senolytic Activator instructions call for taking just two vegetarian capsules, once a week. Try it today!